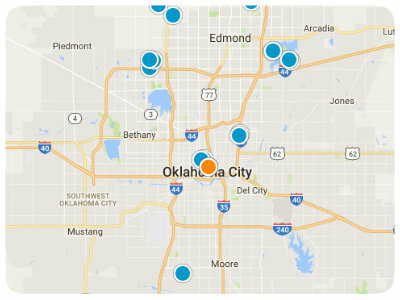 Oklahoma City is a great place for a family to relocate to because it boasts one of the lowest costs of living in the entire nation. Moving here will allow your family to enjoy approximately 300 days of sunshine a year. Along with the weather, it also provides plenty of entertainment, education and job opportunities. 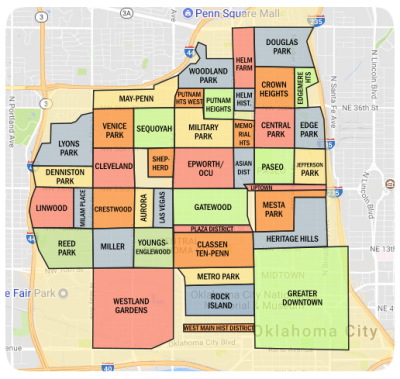 All of these opportunities are found within quaint communities for families to thrive along with a city around the corner from these Oklahoma City, OK single family homes. Western Heritage can be seen on every street, block and corner. The downtown area of Oklahoma City sits on a riverfront lined with museums for the art-savvy. Many visitors flock to historic Deep Deuce area for music, dancing, rhythm and blues that has been around for decades. Finally, the Asian District is located outside of the downtown area where one can enjoy plenty of food and shopping along with the Asian decor the area provides. Basketball fanatics and children will enjoy the fact that Oklahoma City is home to the NBA team, the Oklahoma City Thunder. People near and far flock to see them play in hopes that they will once again make it to the Finals, like they did in the 2011-2012 season. For those who don’t find sports intriguing, they can stop by the Cox Center. The Cox Center hosts trade events, concerts, and children’s performances for all ages. Children will love to stop by the Oklahoma City Zoo to see more than 2,000 animals during the day. They can also stop by the Science Museum of Oklahoma that is located next door for a full day of educational experience. Entertainment is abundant throughout the entire city. There is no possibility that a future resident could ever regret their relocation choice. The education that Oklahoma City provides to its residents is impressive. Instead of having a generic course load for all, the public school system shows high success with the implementation of arts classes and Spanish immersion programs. Building seven new schools since 2001, Oklahoma City has the privilege of being the second largest school district in the state with a grand total of 91 schools surrounding single family realty in Oklahoma City, OK.
After graduation, they will have an opportunity to further their education at several local colleges. The largest university they are home to is the University of Oklahoma. The University of Oklahoma also owns the Oklahoma University of Health Sciences Center and the College of Law, one of the five places to graduate as Rhodes scholars in the nation. With the median income for an Oklahoma City resident being approximately $40,000 per year, relocating here is a great idea in this economy. The majority of housing choices are cozy ranch styled homes. Each place has approximately 3 bedrooms, which is very convenient for those with children. These homes are established outside of the downtown area’s apartments and condominiums, with an easy commute for the full-time thriving business worker. For those who enjoy the quick pace of the city but also want to feel the quietness of a home for a growing family, Oklahoma City is the perfect choice. Not only is it economically smart, the weather is sunny three-hundred days a year. Children are able to receive some of the top education in the nation, along with visiting the zoo. Also, basketball fans can locally anticipate the NBA playoffs. Oklahoma City is a place for all seasons and the perfect place for all different types of people.